In college I got the opportunity to spend 4 months studying abroad, splitting the time between London, UK and Florence, Italy. It was one of the best times of my life and I had so much fun visiting new places and trying new foods. Although it's hard not to have a soft spot for home-cooked Italian cooking (which I got to enjoy IN Italy no less, jealous? ), sometimes I get a hankerin' for English Pub food as well. I used this recipe from Food Network as a base, and then altered it as I saw fit. 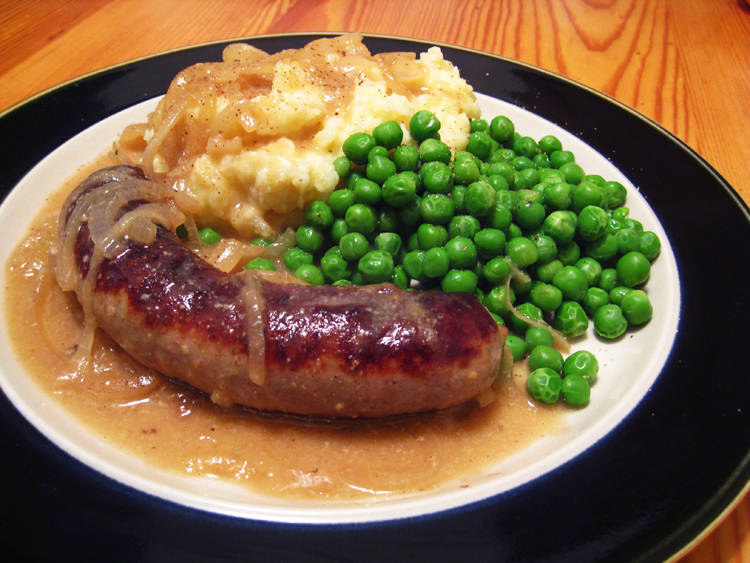 Pair this dish with a cold pint and you can almost imagine being back in London...almost! p.s. I'm the first to admit that home-photographed food looks disgusting about 9 times out of ten. I tried my best you guys, and the food really is delicious! Trust me! Dice potatoes (If they have thick skins, peel them first). Place in a saucepan with garlic cloves and cover with cold water. Bring to a boil, and simmer until tender. Meanwhile, prick sausages with a fork, heat a skillet and brown the sausage in 1 tablespoon oil. Slice the onion. 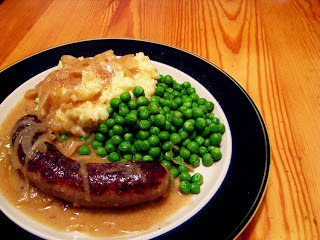 Remove the sausage to a plate and add the onion to the pan. Cook onions until soft, add 1 tablespoon of butter and melt, then add 2 tablespoons flour, cook for 1 minute. Stir in the chicken stock, mustard, and Worcestershire, and return the sausage to the pan, cooking it through for about 15 to 20 minutes. Put peas in saucepan and cook according to directions. Drain, season with salt and pepper. Drain the potatoes and mash. Add the milk, butter, and sour cream. Season with salt and pepper. You are correct, I don't have the apple one, but I wasn't looking for an apple one either. You should make it and link the recipe on your blog.